Marvel Celebrates Female Heroes with A-Force! Ms. Marvel. Thor. Captain Marvel. Black Widow. She-Hulk. They’re mighty. They’re Marvel. And they’re exploding on to the scene in A-Force Presents Vol. 1 – the first of a brand new bi-monthly collection coming to comic shops and book stores everywhere in September! 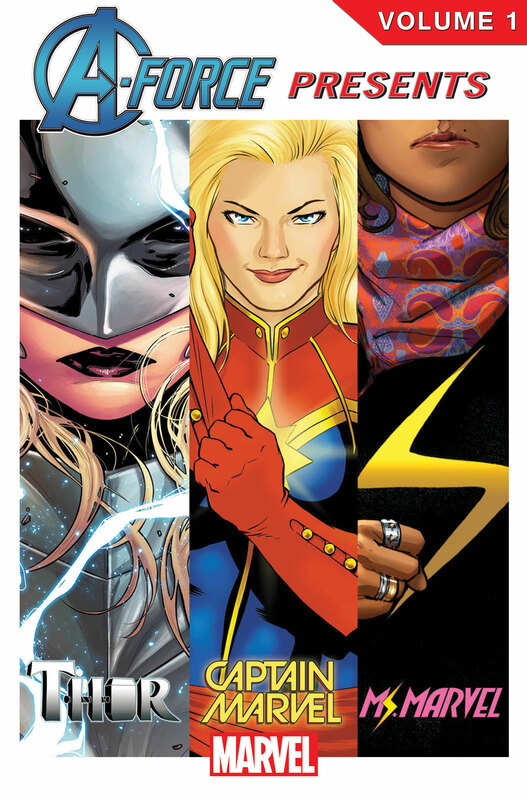 A bi-monthly series focusing on the strength, courage and power of Marvel’s female heroes, A-Force Presents collects a new selection of Marvel’s critically-acclaimed female led titles for fans to explore. Targeted towards young adult readers, each volume of A-Force Presents includes 6 issues and offers a clean entry point into the Marvel Universe through some of the most popular titles. Releasing this September, the first volume, A-Force Presents Vol. 1 collects the critically acclaimed first issue of Ms. Marvel, Captain Marvel, Thor, She-Hulk, Black Widowand Unbeatable Squirrel Girl. Don’t miss your chance to jump on board with Marvel’s mightiest superheroines when A-Force Presents Vol. 1 bursts on to the scene later this year!